Jessica and Ryan Rudegeair both grew up in Venango County and work each day to make a positive difference here. “We always look for ways to give back to our community and help shape the future opportunities for the youth and everyone in our county,” they said. Jessica was born here and after graduating from Clarion University, she moved to Charlotte, NC, then Pittsburgh. Her mother’s breast cancer diagnosis brought her back to Franklin for what she thought would be a temporary stay, but that changed when she met Ryan. Ryan was born in New Orleans, but visited Venango County each year to see his relatives. His immediate family then moved to the area when he was ten and, other than his childhood and his time at Penn State University, he has always considered Venango County his home. 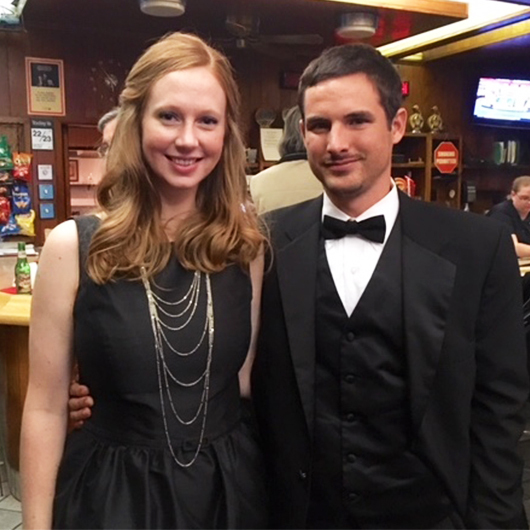 After settling in the area and getting married in July of 2015, Jessica and Ryan have been engrained in the community, both through their careers and volunteerism. In late 2016, the two heard about an eight-lane bowling alley that was for sale and they were “crazy enough to consider it.” They are now owners and operators of Buffalo Street Lanes in Franklin and put a lot of hard work and time into it. They took advantage of resources in our area, such as the Small Business Jumpstart Program, Small Business Development Center, and Northwest Planning Commission. “It’s important to ask for help and to get advice, but to remain loyal to your own goals and vision,” they said. Because of their business and a one-year-old son, the Rudegeairs have very little free time, but when they do, they enjoy spending it with family. They both are fortunate to have their parents living in Franklin, and also visit family in Washington D.C. when they can. When they do have a moment to themselves, Jessica and Ryan enjoy going out to dinner and drinks at local restaurants, seeing a show at the Barrow-Civic Theatre, catching a movie at the Movies at Cranberry, hanging out on the porch of the Witherup House, and taking advantage of the local recreational trails. They also are “reuse repurpose people,” and Jessica can often be found browsing the racks at the Salvation Army and Goodwill. Ryan has served on City Council, but unfortunately had to give up his seat when they moved out of their previous district, but they now contribute to the community in other ways. Jessica is a board member on the Oil Region Library Association and Ryan is on the newly formed board for Grace Learning Center and also a board member of the Franklin Chamber. They both recently became members of the Elks Franklin Lodge No. 110, too. The Rudegeairs have some ideas in their heads for additional businesses and look forward to continuing their time in Venango County and becoming even more connected. There are many reasons why they love being here, including the size of the area, affordability, ability to start and buy businesses, friendly people, beautiful seasons, proximity to cites such as Pittsburgh, and the history.